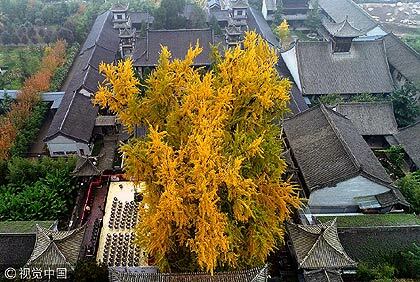 A 1,400-year-old Ginkgo tree on the grounds of the Guanyin Temple in Luohandong village in the city of Xi'an, Shaanxi Province in China has become such a hot tourist attraction that visitors must make online reservations before visiting. 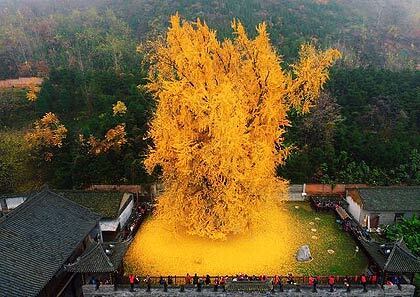 It suddenly gained fame in 2016 because of photos on the internet of the tree's "sea of gold" autumn foliage. As it gained more attention, visitors flooded in to see the tree for themselves. 70,000 people a day visited during the peak season, and some had to queue for three to four hours to get in. The temple has introduced a limit of 7,200 visitors a day, from Oct. 28 to Dec. 10 and opens at 8 in the morning and closes at 5. The temple was built in 628 during the Tang Dynasty (618-907) and is located 30 kilometers from downtown Xi'an. It is said that Emperor Taizong Li Shimin personally planted this Ginkgo tree.